Bally stands for impeccable quality. Although the main focus of the Bally brand is the shoe making, their handbag line is as perfect as the footwear. Bally brand was started in 1851 when Carl Franz Bally together with his brother decided to take on shoe making business. This company is a Swiss brand and the first shop was opened in Berne and Zurich. The company was one of the first to use new technologies for manufacturing and soon they became the market leaders of the time. The company launched its first handbag collection in 1976 and since then the Bally men's messengers and purses for women have earned the impeccable quality status among designer bags. Their products, including Bally handbags can be purchased worldwide and also you can buy gym handbags and messengers online. 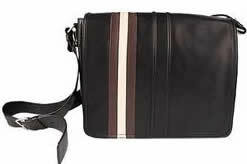 This company also has a vast selection of Bally totes, luggage and other products for men, such as briefcases, carryalls and business bags. 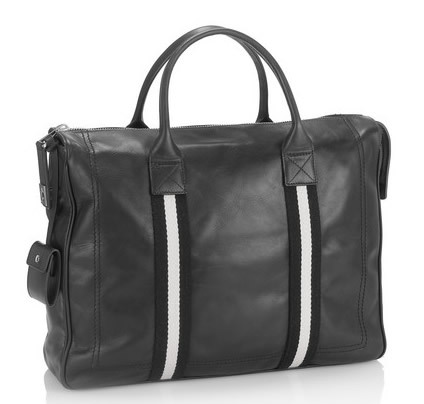 Tajest-MD textured leather weekender is an ideal example to show what the brand is about. This model costs 650 EUR, which is 935 USD. It is sufficient in space, the dimensions are depth - 11 cm (27.9"), height is 34 cm (13.4") and the width is 41 cm (16.1"). The handbag can fit a laptop (preferably sleeve wrapped). There are internal pockets that can be zipped. Also the closure is zipped. It is made of calf skin. The current color choice is black with black and white textile lines. It can be bought directly from the company's official web page. If you need a multifunctional handbag then the carryalls from this brand can be used for travel or as gym bags. For example, the masculine Tekaro handbag is made of high quality calfskin, it has a detachable shoulder strap and comfortable internal pocket. What has not been properly recognized are their luggage bags made of nylon. There are leather versions as well, so if you can afford you can opt for the more luxury and expensive models, although the manufacturing quality for all their products is meeting the top standards. These bags are affordable men's handbags from the luxury design shelves. If the price might seem a bit too high from the first glance, then you have to remember that these products are quite lasting and won't be worn and torn any time soon. This Swiss brand offers also a wide range of totes for male clients. Whatever are your wishes, this company has it covered for you with style, elegance and quality.